Like a family reunion, but you can hear the stories over and over! You invite family and friends to record a memory and send photos. We turn them into a shareable heirloom video like this one. Learn More! Turn a conversation + your photos and video into a family heirloom. You record a memorable “Talk” using our free guide. We turn it into a shareable heirloom video like this one. Learn More! The easy way to write and share a life story. We turn it into a printable, shareable heirloom like this one. Learn More! A couple of years ago I was walking out of a condo and overheard a slightly disheveled but very polite man ask the door attendant to call a taxi for him. The attendant said no. My husband picked me up and as we drove out the driveway I had him pull over. I offered to call a taxi for the man. It was a small thing, nothing really, but the man was incredibly grateful, oddly grateful. Why did that mean so much to him? When contemplating our own mortality most of us want to feel that we have had some impact on the world. Our children and grandchildren are our legacy and hopefully, carry the best parts of ourselves forward. But the fact is we can never really know how much of a difference we make. As we near the end of the time we have been given, the thing our hearts long for the most is to know just that. My first non-friends-and-family client changed my business – I help people tell their life stories. Debbie wanted to give my services to her parents for Christmas, but her father had Alzheimer’s Disease and he was just too advanced. 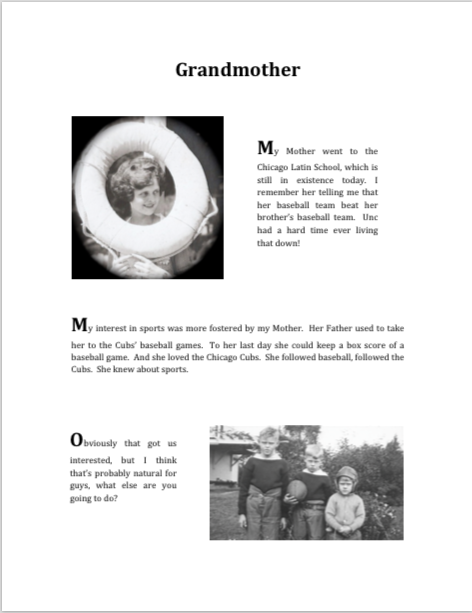 So instead, each of their 8 grandchildren (from age 37 to 9, from Alaska to Florida) wrote and recorded their favorite memories of their grandparents. I turned the recordings and some old photos into a video that they were all able to watch Christmas Day. I see Debbie occasionally around town, and every time I see her she thanks me for the video. Her father passed away the following May. If someone you love is ill or elderly please make a point of letting them know how they have affected your life. To know in the end that you have really made a difference in the lives of those you love just may be the greatest gift of all. "Pop passed away a few months after we gave him our video. It helped us heal after his passing and is a treasure for our whole family"